“New York Live” on NBC featured Image Skincare’s MAX™ Facial Cleanser last week during a segment on cleansing and moisturizing beauty products. Beauty expert Anna De Souza says the Facial Cleanser is like “botox in a bottle”. 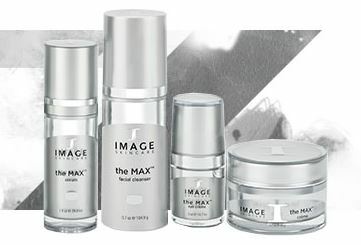 The MAX™ line is the latest advancement in anti-aging. While repairing cell damage, it also works to support your skin’s natural defense mechanisms. MAX™ uses a combination of plant-derived stem cells and nutripeptides® to plump your skin. IMAGE’S three-phase CPN System of Correction, Prevention, and Nutrition is employed in this product line. Correction comes from the use of peptides, while stem cells work toward prevention, and botanical agents provide nutrition. Pure and active ingredients provide protection from nutritional imbalance, oxidative stress, and UV damage, all at the cellular level. Used daily, this acid-free, sulfate-free, and paraben-free cleanser balances and optimizes the skin’s pH. Anna De Souza stated this cleanser “has a botox-like peptide which helps to reduce wrinkles by inhibiting muscle contractions over time”. This day and night serum uses multi-layered technology of nutripeptides to plump your skin. It dramatically reduces the appearance of fine lines and wrinkles. The MAX™ serum is known for its unique high concentration of effective ingredients to give you the maximum benefit. Two different strains of plant-derived stem cells prevent and reverse signs of aging in your skin. This creme repairs cell damage and protects against free radical damage to maintain a healthy skin structure. See maximum benefits by using this creme every evening. This eye creme reduces puffiness and inflammation of the skin and prevents cell aging. It is recommended for those with aging, fine lines, wrinkles, dry and sensitive skin. Use of grape, alpine edelweiss, and apple stem cells work to reach the ultimate age prevention.